in-vehicle order tracking to MIMO analysis. We, A&D Company, are proud to introduce our brand new Compact WCA for analysis of noise and vibration for in-vehicle order tracking analysis.The long time experience and know-how of A&D in the automobile field of instrumentation and listening to user suggestions are what gives the A&D model the lead with its unmatched specification and functions. Best of all is its compact size and light weight. At the same time, all the functions you would expect to find in multi channel noise and vibration analyzers are included, plus more enhanced features. The features are impressive performance in a compact package from in-vehicle order tracking to MIMO analysis, as follows. WCA Pro, the base software for Compact WCA, has user interface of Windows operability. 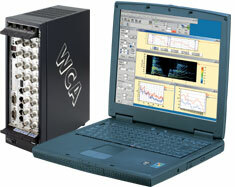 WCA Pro provides real-time FFT analysis for noise & vibration testing. Optional licenses for integrating real-time octave analysis and tracking analysis are available. The system comes standard with throughput acquisition, allowing continuous recording of time history data to disk and repeated playback analyses. Off-line playback analysis with a standalone PC is also possible (option). The testing efficiency of real-time multi-channel FFT analysis is ensured by ease of operation and well designed Compact WCA data management. A variety of post-processing tools are also available. A signal generator for 1 or 2 channels (up to 4 channels in a 32-ch system) is optionally available. The standard system includes MIMO (Multi-Input Multi-Output) analysis, which calculates multiple structural responses caused by multiple excitation forces. 1/1, 1/3, 1/6 and 1/12 octave analyses are supported. Simultaneous measurements with FFT analysis are possible. 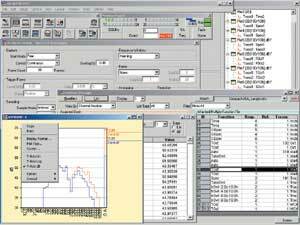 A wide range of analyses, such as order ratio analysis, RPM tracking, time tracking, octave tracking, phase tracking, Campbell plot, are supported. Multi tacho analysis is also available. COM support capability enables complete control of the Compact WCA system with external application software such as Microsoft Excel. Customized menu design and automated routine processing are possible. Time history data can be recorded on the hard disk of the PC for playback analyses. Off-line analysis on a standalone PC is also available with off-line license. The recorded throughput data can be exported in WAV format. The Compact WCA system is scalable from 4, 8 to 16 channels in a single A4 size front-end. Expansion to a 32-ch configuration is obtained by a synchronized connection of two 16-channel front-ends. Flexibility is provided to allow two separate mainframes with 4, 8, or 16 channels to be operated as a single 8, 16, or 32 channel system, and vice versa, by synchronizing the dual mainframes. The front-end hardware is connected to a PC via LAN (100Base-T). Signal Output Voltage ±2.5V max. Signal Frequency 40 kHz max.